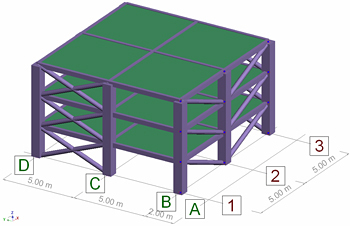 For this example we will modify the structure architecture by moving the column from B-2 to the A-2 position. The column consists of 3 parts, one part for each story. To move this column to the new position with the column still connected with the rest of the structure, a certain procedure must be followed. The first step of the procedure is to create points in all the structural elements intersections that must be moved. Having all the points in place, the user must access the Move command. 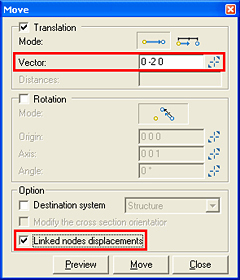 In the Move window, the user must insert the translation vector (in this case X=0; Y=-2; Z=0) and also enable the "Linked nodes displacements" option. The column was moved to the new position and all the other structural elements, linear and planar, were modified so that the column would not lose the bond with the rest of the structure.